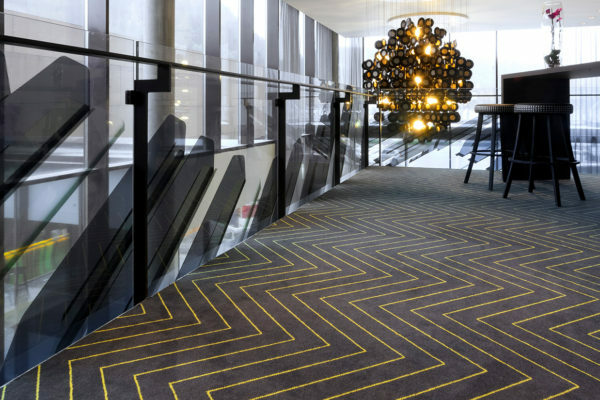 SCANDIC Rock City Hotel in Namsos, Norway, is a truly spectacular Rock hotel – with rock poems weaved into the design carpets from Dansk Wilton. SCANDIC Rock City Hotel in Namsos, Norway, is a truly unique and spectacular rock hotel – with huge beds shaped as a guitar and rock poems weaved into the carpets. It’s the first of its kind in Norway, centred in the heart of Namsos and with a breathtaking view of the lake. The idea to create a rock hotel originates from the region’s proud rock traditions, especially the particular branch named Trønder-rock. The interior decoration concept was created by Sias Contract AS, an Oslo based interior design company. 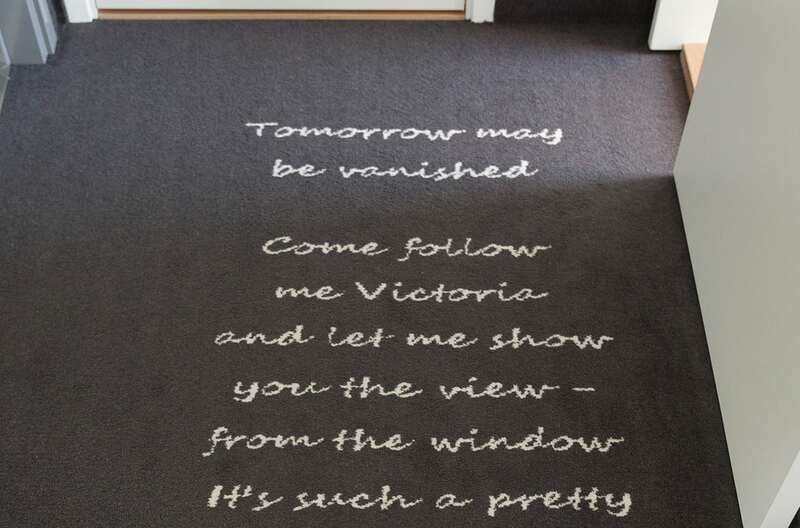 Besides being able to see their writing on the carpet, a lot of pictures and various items from the musicians were also included in the hotel decoration. For example, a chandelier in the lobby made of old vinyl records contributes to a consistent retro style in bright colours throughout the hotel. The carpet designs emerged in a close cooperation between owner (at the time of this project RICA Hotels), contractor, interior design company and Dansk Wilton. 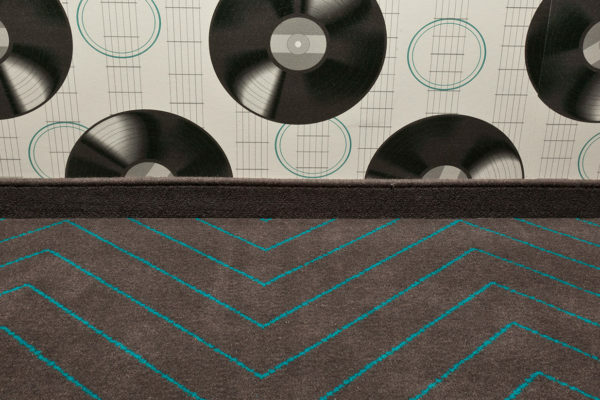 “Various design alternatives were presented to Dansk Wilton’s design team and carpet samples were returned to us before a final decision was made and the carpet production began. This set-up has worked very well for several years for us and Dansk Wilton”, says Chinma Consulting Project Manager of Rica Hotels. 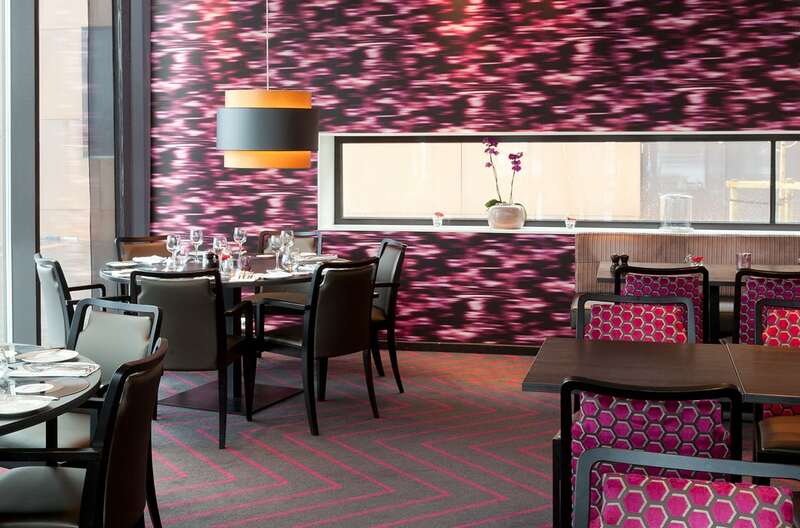 Dansk Wilton is proud to have supplied all carpets for the Rock City Hotel in Namsos. The hotel has 96 rooms, 11 deluxe rooms and 10 disabled rooms. In addition, it has a restaurant, several meeting rooms and a conference capacity of 400 persons. The rock theme is reflected in all areas throughout the hotel. “For Sias Contract AS the most crucial issue is that the owner of the hotel is delighted with the visual outcome and that the occupancy rate of the hotel remains high. We dare to say that we have performed extremely well on both parameters!”, says Mr. Martin Strømmen. Dansk Wilton delivered all carpets for the Rock City Hotel in Namsos.